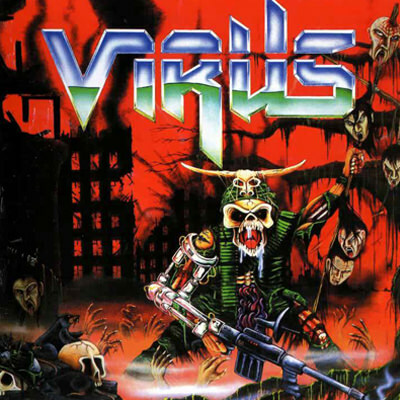 Recently we posted a retrospective review in light of 2018 being the 30th anniversary of Virus‘ classic album Force Recon. We’re also hosting their first live date of to celebrate this at Smashed Fest. For the hat-trick, we now have a one-on-one interview with the man at the heart of the band, Coke Finlay. It took a while to actually make it to the location for today. Several attempts at connecting via social media failed to prove fruitful, but, luckily, the nearby Wetherspoons stock a delightful array of very dark real ales for entertainment. Sitting and supping, I notice a fair few patched up denim cut-offs wading their way through the bagpipe drenched throng. It makes me wonder why, in spite of the seemingly never-ending “shortbread and tartan” push, Scottish death metal can break through, yet our thrash offerings..? Not so much. Fantastic bands, making all the right moves, such as Thrashist Regime and Disposable seem somewhat overlooked. I move to a quieter end of town to mull it over, before eventually making contact. The thought is still with me, as we meet up and ease into a very natural conversation. Albeit fairly candid. Coke Finlay: I don’t see Disposable as a thrash band. They just don’t sound ‘thrash’ to me. I’m probably too old for Disposable. You’ve got old school thrash, and you’ve got new school thrash. I know what new school thrash is, and I still wouldn’t put them in that category. 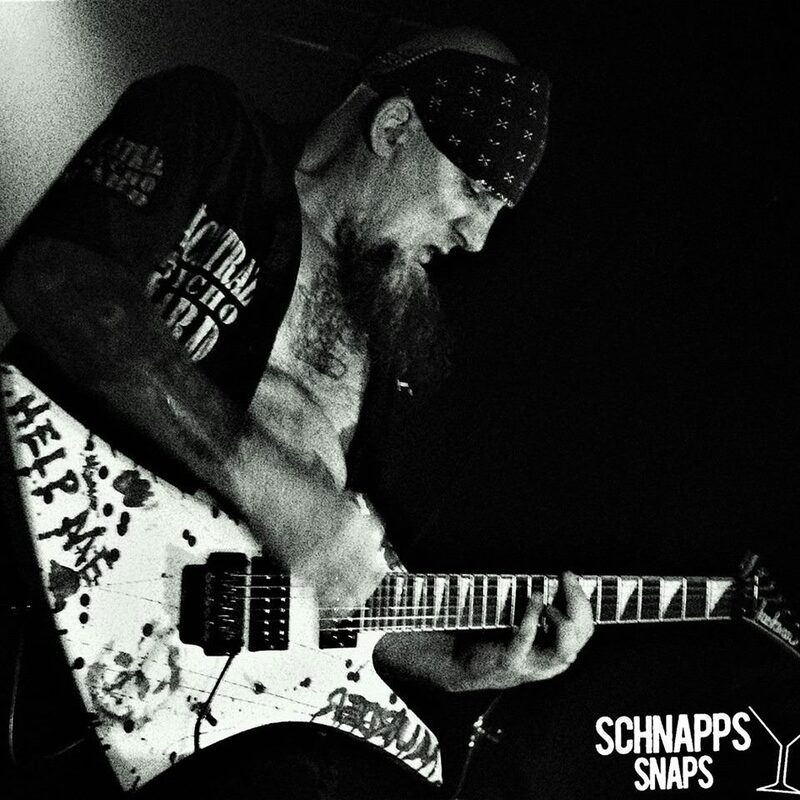 SDM: True, some UK bands termed as thrash sometimes have more in common with death metal. CF: Yeah, it’s the vocals I think. A lot of people who think they’re in a thrash band, the vocals put me off. I mean, bands like Gama Bomb; definitely new school thrash. Mutant. New school thrash. Thrashist Regime, definitely. Circle Of Tyrants. SDM: Half of these being Scottish, but the term ‘Scottish thrash’ isn’t really bandied about at all. CF: It’s definitely there, you can tell it’s there. It’s just not widespread. When I go to America, I’ll be doing interviews, and I’ll just bang on about it. SDM: Why do you think you’ve had such an easy time booking loads of Euro dates, but struggled with the UK? CF: Europe’s been great. Europe’s been fantastic. We’ve got 17 dates there, which is absolutely banging. I’ve got a promoter in Europe doing it all for me. He’s based in Germany, and he plays for the band Hateful Agony, that we’re on tour with. So, he’s just organised all the dates for us. We’re also playing with a band from South Korea called Sahon. The reason I got in touch with them is because I speak Korean (Also French, it comes to light – SDM). It’s not a normal language to learn, but… I’m learning it. I’m going to Seoul next year with my Missus. CF: I think it’s because we’ve been out of the scene for so long, and we haven’t done gigs in mainland Europe. The scene’s moved on, and I think there’s just a lack of interest on the promoters’ parts. Because they don’t think we’re (as) recognisable as some of the other bands that are in the thrash vein. Which I can’t understand, because I’ve messaged promoters in Glasgow, Manchester, London, Birmingham, Brighton, Bristol, and Wales, and I think it’s been really lackluster and very disappointing. They’ve got back to me; they can’t book me. Certain promoters have got back to me, they’re not having a lot of luck finding gigs for us. And I think it’s mainly because money is a problem. SDM: There’s a lot less of it going around, that’s for sure. CF: There’s a lot less money going around, there’s a lot less interest in thrash. UK thrash, I think. But it’ll pick back up again. But the thing is, I’m not really interested in the UK, see, ‘cause the UK’s let me down that much that I’m looking towards Europe, Scandinavia, America, and Japan. And the record company that I’m with can do that. SDM: That’s Combat Records, Dave Ellefson of Megadeth’s label? CF: I’m also on Dave Ellefson’s booking agency. We’ve just joined it, but American dates, we won’t have trouble with. That’s where you want to crack it. What I can’t understand is the likes of (Scottish metal fests) Lords Of The Land and Heavy Scotland (sadly now cancelled) aren’t getting back to me, but we’re on one of the biggest thrash metal labels in the world. I understand Bloodstock, because (they say) we need a ‘product’. We need something new, to show the guys at Bloodstock that we’re actually doing something, that we’re working. But we’re doing a European tour, so I thought that would be enough, ’cause they (UK fests..?) put on bands who haven’t even done albums. I think it may just be who’s the flavour of the month. SDM: Another problem for Virus seems to be retaining personnel. How many members have you been through in the last couple of years? Why the high turnover? CF: That is another thing that’s probably stopped us from getting a lot of gigs and a lot of festivals, the huge line-up changes. And that’s just due to personal preferences and differences in musical taste. And probably people smoking too much dope. Members I had before all smoked heavily, and I just couldn’t relate to that. Also, there was disappointment about not getting the Mosh Against Cancer thing, because of certain things happening in the band. Not due to myself, because I definitely wanted to do it; I don’t like cancelling gigs. It was just due to certain things in the band that stopped us from doing it. It also lost us our manager, and our booking agent in the UK. (The high turnover) is basically just me still wanting to do it. ‘Cause if I don’t want to do it, I’ll just say ‘No’. If I don’t think it’s worth it. But I think I’ve got the right people now. SDM: 30 years is a long time. Would you ever consider re-recording Force Recon? CF: Well, that’s a possibility. We talked about it. It’s not certain it’s going to happen, but we are re-recording a couple of tracks for the new, album, so a couple of Force Recon songs will go on. SDM: So, there’s some new product. Will that help on the booking front? CF: It’s definitely up to that. I think for the last couple of years it’s because… You need to be constantly touring, gigging and gigging, every year, and we haven’t done that. We haven’t been consistent enough, I don’t think – with the gigging – to merit getting on any sort of festivals. That’s going to change now. It’s definitely going to change now, because we’ll be gigging, we’ll be going to America next year, hopefully be doing a couple of gigs in Scandinavia near the end of this year, and sort of trying to build up some kind of following like we had many years ago in the UK, and trying to regain the status. Reconnect with the fans. Because it’s not really happening yet. I don’t think. But I get messages from guys on Facebook saying “When are you playing here, when are playing there” and I just turn round and say to them “Well, we’ve not got a contact there, or they haven’t bothered to get back to me”, so when that happens… Especially in Glasgow. That’s been a f***ing nightmare. SDM: Would you say there are new influences on this record? CF: A little bit… A little bit… It’s not entirely djent the whole song, it’s just bits, because there’s certain djent bands that I do like, and they stick out to me. There’s (also) probably a bit of very old school Violence. It’s very predominant in my playing anyway, because it’s one of my favourite bands. There’s probably a little bit of Suicidal Tendencies in there. There’s quite an influence of Testament in one of the songs… definitely the metal end of thrash, I would say. It’s definitely a progression from New Strain Of An Old Disease. It’s definitely a departure from that. Faster. Moshier. I think it’s a good balance of the old mosh style, the old thrash style, a bit of the new thrash style, maybe a little bit of Municipal Waste in there, little bit of Crisix (Spain) little bit of Lost Society. And a little bit of Annihilator as well, because I’m huge fan of Jeff Waters. SDM: Thank you Mr Finlay! As per all interviews here, we’d like to ask if you have any last words to add? CF: I would say to people don’t write off Virus yet. We’re still getting the headline shows, we’re still wanted in certain countries. I expected more from the UK, but I suppose that’s just the way it is if you’re out of the scene for so long, it’s hard to get back into it. Because we’re established, I thought it would have been easier, but obviously, it’s not. I suppose in closing I would just like people just to connect to Virus again, because there’s good things coming up. The album will do really well. If it bombs, I’ll take full responsibility for it, but I’ve got a feeling that it won’t. Posted in Latest News and tagged Combat Records, Force Recon, Interviews, Metal News, Perth, Slow Dragon Music, Smashed Fest, The Twa Tams, Thrash Metal, Virus.